We were thrilled to be given the chance to sit down with Brad Fuller, a producer on Teenage Mutant Ninja Turtles: Out of The Shadows out June 3, 2016. 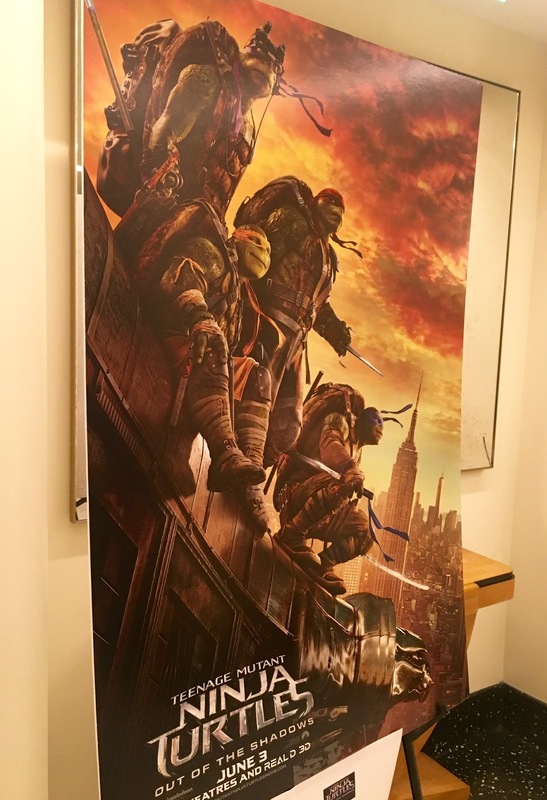 Fuller worked on the first TMNT film back in 2014 and has returned for the sequel. Read below to find out why he and his partner, Andrew Form, set out to produce the TMNT movies, the difference between the first and second film and his thoughts on Stephen Amell. Make sure to also read our interview with Stephen here. Q: What made you want to produce the TMNT films? Q: You’re a producer but a lot of people don’t know what that means exactly, can you describe what your role was in the creation of the movies? Brad: “It’s different from the first movie to the second movie, there is things to do. The way I look at my job as a producer is more like a traffic cop and just keeping the traffic moving. I guess to get specific, we are responsible for developing the script, hiring the director, finalizing the budget, dealing with the studio and we are very involved in the marketing campaigns of the movies as well. Q: I saw a couple of scenes of the film and saw the turtles visit Brazil. What made you guys want to have them travel to a different country? Brad: “The first movie took place entirely in New York and the movie did very well internationally so we wanted to go to a different locale that people don’t see everyday and those falls were an amazing location. It just felt right for a great action sequence. I am very proud of that action sequence, we’ve been working on that for about two years. When we started the movie that was the first thing we did. Q: Were you worried about taking on the turtles as it has such a big cult following, especially from people who were raised in the 90’s? Q: Are there any more superhero movies we could be expecting soon? Q: What is it like to produce a superhero movie, what is the budget like and such compared to that of a horror movie? Brad: “We don’t talk about the budget specifically, but I would say this to you, we made the Purge for $2.5 million dollars - and I think that would cover one day shooting on this movie [laughs]. I don’t know what the number is but it’s just totally different but, there is a lot of similarities also. It’s different because if we have a problem in the turtle movie, we have money in the budget where we can fix the problem. On the Purge there is no margin of error. We shoot for 32 days and if you don’t have it for that 32 days, then you don’t have it. Unless the studio gives you more money to go back and do reshoots. But the other part of these movies that is a huge plus and a huge minus is that our seven leads are all computer generated. Which allows us the liberty to change what they say, not so much what they do, but what they say up to we were changing dialogue coming out of the turtles mouth as recently as last Friday (six days prior to this interview). Now, if that were an actor I couldn’t do that with the movie coming out in two weeks. Working with the turtles is very expensive, they are as expensive as any movie star there is and there are four of them so you can do the math. It is very expensive to do that but that doesn’t affect me in the film making process, it’s more of a post issue. Q: What do you think sets the TMNT franchise a part from other superhero franchises? Brad: “We talk about that in our offices a lot. I think most of the superhero movies that I’m seeing now there is a lot of darkness and brooding, and we wanted to make the happiest and most fun superhero movie so that we can be different from everything else that’s was out there. Also I think our movie plays younger, it’s more of a family film as opposed to something. I have two kids who are 19 and 23 - it’s not their movie if I weren’t their dad. They would be more interested in seeing Captain America than they would this. But we are trying to stake out the area of the market where families can go with their kids and have a lot of fun but have big movie action like with that scene you saw (referring to Question #3) I think is incomparable to anything I’ve seen this year. The turtles are making jokes as they are going through the whole thing, so that’s the difference in tone. Q: You have produced different genres of movies, which is your favorite? Brad: “I guess my favorite to make, we made a movie last year that bombed called Project Almanac. That was a great experience because I felt like in that movie we worked with a guy who’s never directed a movie before and I’ve worked with a lot of first-time directors and the difference between Dean Israelite, who is now making [the new] Power Rangers [movie], and everyone else was Dean was as talented as a director I’ve ever seen first time out. So as a producer it is a great joy to watch someone who comes on set, has no experience, and naturally knows how to do it. I’ve known Michael Bay for 35 years and we grew up together, and I kind of saw the same thing in Bay when he was a kid so from a personal standpoint working with Dean as a director was really kind of gratifying. The other side of it is the ego side of it. You want to make a movie that people see or when people come up to me, producers aren’t very high-profile and it doesn't happen very often but, if my kids tell people what I do they’ll know the Turtles movie and that is very fun too. Q: How is this film different from the previous? Brad: “I think if you’re going to make a second movie, you have to give the people a reason to go out and see it and I think that in our first movie we were a little bit too dark at times. I don’t think parents could take a 7 year old to that movie there is some gun play shooting and bombs on a wall by people’s heads and I would hear from people that they didn’t take their kids to see the movie. What we tried to do this time was make the movie totally family-friendly on one level but then still up the anti on the action. What you saw (referring to Question #3) was arguably the biggest action sequence in the movie. But there are two other sequences that are equally as big so I guess you have to up the anti on the action and character wise you have to refine the characters so that people keep coming back and wanting to see what’s happening with the brothers and in this particular movie we tried to make them as funny as we possible could, more so than the first movie. Q: You’re adding Bebop and Rocksteady and Stephen Amell is playing Casey Jones, what has been the internet’s response in adding these really famous characters? Brad: “The adding Amell I have not seen any downside from it. Usually the internet will say we bad a bad casting choice but there has been nothing negative about that and likewise with Tyler Perry, there has been nothing negative about that. Bebop and Rocksteady, those are characters that we originally had in the first movie and we couldn’t figure out how to make them fit into the story so we put them in the second movie and again, everything people have seen they like but there is more trepidations about those characters for whatever reason. I think those characters are so beloved that there is concern ‘did we do them justice?’ and I believe we did. Q: What advice would you give up-and-coming producers or someone who is interested in becoming a producer? Brad: “I think the most important thing and it was for us [Andrew Form] so I can only say it based on that is that we chose a lane early on and before I was partnered with Michael and Drew, I produced a couple of other movie and I didn’t really choose a lane so what I ended up being was a guy who trying to get movies made. I think the important thing is to pick what movies you want to make and be if not the best, one of the best in that area. We did that with horror. We had a game plan, we were going to just make horror movies but we were going to make them look better than all the other movies out there because that were the resources that were available to me. I could say to Michael, ‘we want to make this movie can you get me your camera operator, your gaffer and whatever other crew people so we made Texas Chainsaw Massacre for $9 million dollars but if we would’ve paid people their rates it would’ve been a much more expensive movie so my resource was using Michael’s people to make it better. 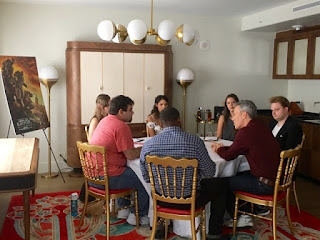 As an overall goal we wanted our movies to look better and that made them feel richer and I believe thats part of how we started our company to build a brand because that’s what people knew they could come to us for. Q: What was the decision to cast Stephen Amell as Casey Jones? Was that a first-choice or was there a process with that? Brad: “No, there was no process. It was him. It was always him. When you’re talking about a great looking guy who Megan Fox can realistically have feelings for, she’s the most beautiful woman on the planet or one of them so you gotta get a really good looking guy who is a great actor who can do the physical nature of what it is and you don’t want to take a guy who has never worked before because if you do that, you’re really running a risk and I didn’t think that would be good for the morale of the crew because you have Laura Linney, Tyler Perry, Will Arnett and all these people and you put a kid in there who doesn’t have the experience that’s not going to work. When you start checking the boxes, Stephen Amell is the only person you can check every box and we were very lucky our shooting schedule corresponded with his hiatus on Arrow and he was the right choice. He was really fun in the movie. Q: Which one of the turtles do you identify with the most? Brad: “Did you know yesterday I was asked that in every single interview and I’m telling you on every interview, I chose a different turtle and gave a reason why. I will tell you my favorite turtle is Mikey. I just think that’s the guy. Q: Do you have any upcoming projects you're exicted about? Brad: “I do. Were would you like me to start [laughs]. We have Purge: Election Year that comes out a month later which is much better than the first one. This third one is very good also. Last year we made a movie that did very well at the box office called Ouija and I had no expectation that movie would do what it did and we brought in a guy to do the sequel to it and he killed it. Then we have season three of The Last Ship coming out in June and a new show called Jack Ryan for Amazon. Q: How much inspiration did you take from the live-action TMNT movies such as Secret of The Ooze? Brad: “The hard thing about this franchise, every franchise has it’s own issues, the issue here is that you have cartoons, you have comic books and you have movies and not everyone knows all three of those source materials but everyone comes to the movie hoping to see something they recognize from their source of materials. The issue for us is how do you take pieces from all of those where fans are hoping to see something they recognize and giving it to them and at the same time telling a story that isn't so far in one of those arenas where you alienate the other two. Luckily that's not my job, that’s the writers job and that’s what they focus on and they executed that in a really good way. Make sure you guys go out and watch Teenage Mutant Ninja Turtles: Out of the Shadows starting June 3rd!